Here is a copy of my current CV. Although I have had occasional reason to add to the talks, and still make updates to ZeusMP, I no longer do research. I still keep this page up since it is a nice place to keep slides and posters and similar things. I completed my dissertation working for Dr. Chris Reynolds, studying the interaction between AGN and cluster gas, related to the cooling flow problem in galaxy clusters. A copy of my dissertation can be found here. I also organized the weekly theory group lunch time talks for a while. I hope it is still going strong since it was a good experience (both in terms of organizing and attending). The basic idea was that observations of rich relaxed clusters show that the energy their energy loss due to radiating in x-ray wavelengths is too great to account for the central temperatures and densities in many of the clusters. Some heating or regulatory mechanism is necessary. To study this, I used the ZeusMP code to perform hydrodynamic simulations of clusters with jets from supermassive black holes in the center. ZeusMP is the parallel version of the ZEUS code. Our version of it is meant to run on Beowulf clusters of GNU/Linux machines. A large portion of my time was been spent modifying (and fixing) ZeusMP. We have chosen to make our modified version of the code and the documentation publicly available. ZeusMP is written primarily in FORTRAN 77. Initially I was kind of turned off by FORTRAN, but it is actually a better language than most people give it credit for. Generally though, I prefer to use C, Perl, or Python. I did my second year research project (roughly along the lines of a master's thesis type of thing) on the energetics and morphology of extinct or relic radio galaxies (that is, radio galaxies where the jets are no longer active). I did this by simulating the galaxies with the ZEUS-3D hydrodynamics code. Since I worked in theoretical astrophysics, I don't have any pictures of my own to demonstrate what real radio galaxies look like, but there are some nice pictures of both Radio Galaxies and Quasars here. Radio galaxies are a type of Active Galactic Nuclei (AGN). Basically, in an AGN, the central region of a galaxy is brighter in some or all wavelengths than it should for a normal galaxy (this isn't exactly the technical definition, but it is close enough to get some idea of about these objects). The power source for this is thought to be a super massive black hole in the center of the AGN feed by an accretion disk. Radio galaxies are elliptical galaxies with jets emanating from the central region and ending in giant lobes of hot gas, sometimes many times the extent of the actual galaxy. My work dealt with the interaction of the lobes with the background material. Because the radio lobes extend beyond the galaxy itself, the background material it interacts with is not from material from the galaxy, but is material from the cluster the the galaxy is in. For old movies of my simulations, go to my movies pages. More recent movies can be found in the various talks below. Download our version of ZEUS-MP here. 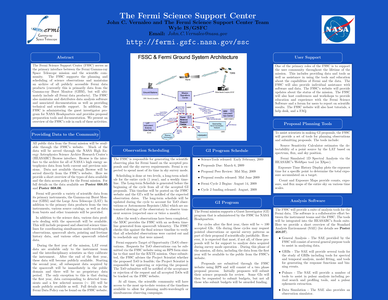 All posters and talks are in pdf format. Images, movies, etc. may be used for any scientific or educational purpose as long as proper credit is given (although I realize pdf is not always the easiest format to get images out of, it is probably the best format for portable documents and talks around). I use a modified version of a common poster class for LaTeX. Here is information on printing large format posters (some of this is University of Maryland specific) as well as a LaTeX class for making posters. 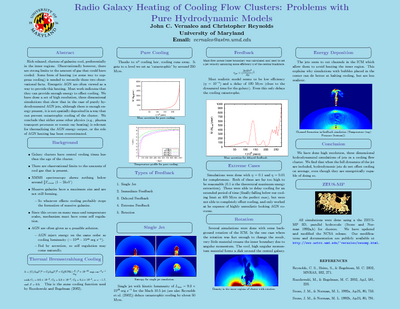 AGN Heating of Cooling Flow Clusters: Problems with 3D Hydrodynamic Models -- Heating vs. Cooling in Galaxies and Clusters of Galaxies August 6-11, 2006 Garching, Germany. In the past, I have used OpenOffice.org to produce slides for talks. This was okay, but not much better than using Powerpoint. Neither method produce especially portable or web friendly talks, neither work well with version control systems like cvs, and neither handle math as well as LaTeX does for papers. The slides I have here were done using the LaTeX Beamer class. This lets me have all the math formatting I want, is done with plain text, has all the pretty features of OpenOffice.org/Powerpoint style slides, and produces very portable files. Fancy features work best with Acrobat Reader 6 or 7, but most of it works fine with xpdf in fullscreen mode (xpdf -fullscreen). And, then best part is that I can embed animations directly in the file (using pdfanim), so I have a single pdf with a platform independent animation included in a single file. Bitrig -- on 05/06/2015 I gave a presentation for NYCBUG on Bitrig. A link to a recording of the talk is here. btcd -- on 04/22/2014 I gave a quick presentation on btcd at the BitDevs meetup. Dissertation Defense -- on 05/15/2008 I defended my Ph.D. dissertation. Here are the slides from that talk. 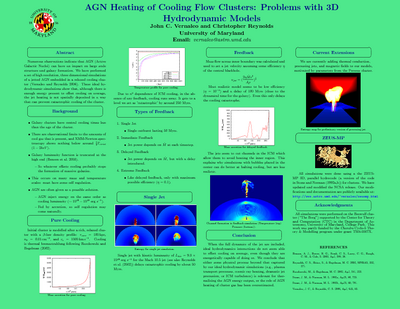 Hydrodynamic Models of AGN Feedback in Cooling Core Clusters -- Unjournal Club, 05/09/2008 (This was a practice for my dissertation defense, so I only have the final slides up. TWiki and Condor -- UMD Astro Hydro Group lunchtime meeting, July 7, 2007. For a full list, see my CV. "Energetic impact of jet inflated cocoons in relaxed galaxy clusters" J.C.Vernaleo & C.S.Reynolds, 2007, ApJ, 671 171. Published, preprint. "AGN Feedback and Cooling Flows: Problems with Simple Hydrodynamical Models" J.C.Vernaleo & C.S.Reynolds, 2006, ApJ, 645 83. Published, preprint, high resolution version and movies. "Buoyant radio-lobes in a viscous intracluster medium" C.S.Reynolds, B.McKernan, A.C.Fabian, J.M.Stone, J.C.Vernaleo, 2005, MNRAS, 357,242. Published, preprint, high resolution version and movies.